Simple intuitive controls gives easy heater control and a constant heater feedback loop enable quick and easy system diagnose. Suitable for: Motorhomes, Caravans, Boats, Cranes, Horseboxes, Trucks & RVs. The HS2211 is supplied as standard with a solid state electronic thermostat which automatically switches the unit on and off to maintain the desired temperature. When the room temperature drops below the selected level, the Heatsource will automatically ignite and run until the cabin reaches the selected temperature. The thermostat is an easy to fit surface mount design and integrates with the new electronics fitted to the HS2211 heaters. With forced air combustion and the Propex two stage stainless steel heat-exchanger, the HS2211 is a clean and highly efficient way to heat your vehicle or boat. 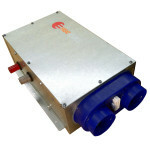 Air for combustion is taken from outside your caravan or motor- home and passed into the combustion chamber having been mixed with gas during three aeration stages; it is ignited automatically and heats up the large surface area of the heat-exchanger. 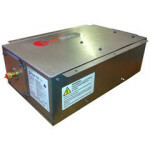 The Heatsource units are totally room sealed and exhaust all products of combustion externally through neat 22mm i.d. stainless steels flue pipe. To add to the efficiency, cabin air is normally re-circulated in preference to using cold air from outside. The HS series heaters are also very efficient on12 volt electrical current consumption drawing less than 1.7 amps on gas operation. 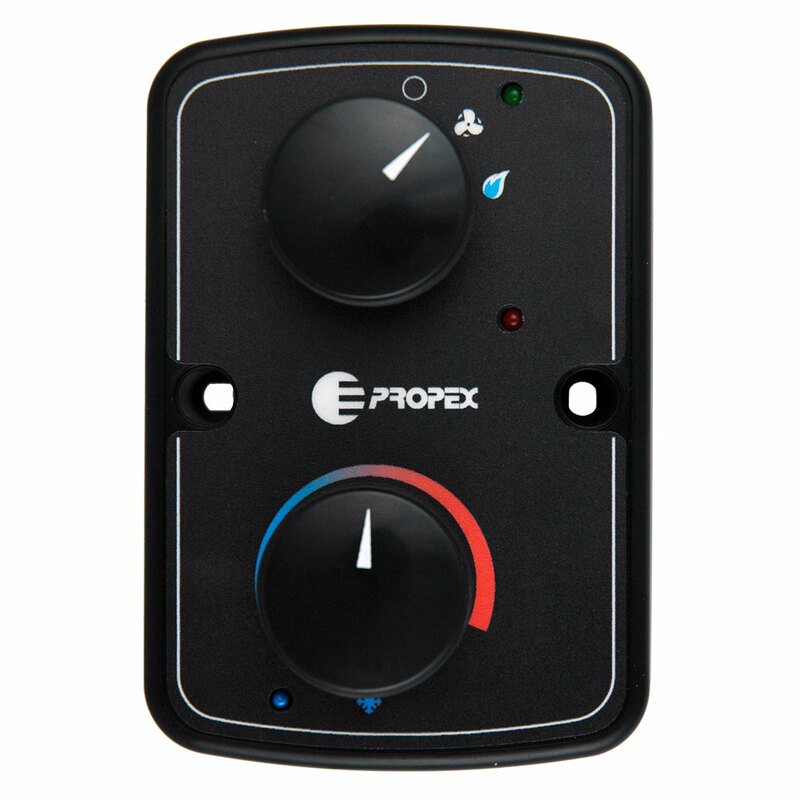 Propex heaters are designed to be quiet in operation without compromising air throughput and heat output. There will always be some air noise from a system that produces a healthy airflow, however, by using high quality balanced fans and smooth enclosed motors with ball race bearings; noise is kept to a minimum. Noise is also unaffected by high voltage, a common occurrence with battery charges, solar panels etc permanently wired. 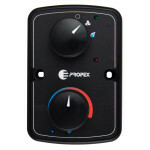 The micro-processor electronics regulates the motor voltage so that the fan speed does not alter between 10 to 15 volts. The HS2211 can be supplied with complete fitting kits to suit underfloor installations, with kits available to cover the number of outlets required. In vehicles and caravans the unit is usually mounted under the floor or between chassis rails, with some vehicle specific mounting kits available, the combustion pipes are then lead out to the side of the vehicle. The low profile design of the heater means no pipes or easily snagged parts are left exposed and so maintaining the ground clearance of the vehicle. The heat is ducted to one or more outlets through tough highly flexible 60mm ducting and up into the vehicle in your preferred location. The ducting runs outside the vehicle should be run inside insulated ducting to minimise heat loss. In the case of multi-outlet installations, the first outlet is an open outlet with directional control and the rest are closable and are used in conjunction with the appropriate sized plastic Y-branches. The heater is made from corrosion resistant materials and sealed against the ingress of water, however suitable provision should be made to protect the heater from direct road spray and debris. Operating range 10.0V d.c. min. to 15V d.c. max.